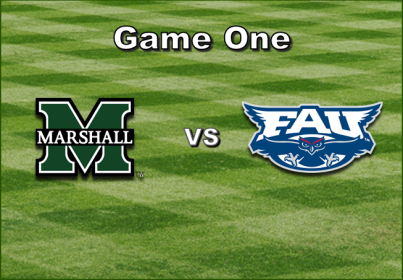 FAU trails 1-2, but outscored the Thundering Herd 20-15 overall in 2014's inaugural series (0-5, 3-7, 17-3). The Owls enter the weekend on a high note after knocking off #6 UCF 11-5 in Orlando on Tuesday night. The win moved FAU to 2-1 against Top 10 competition, all of whom have come from the state of Florida. 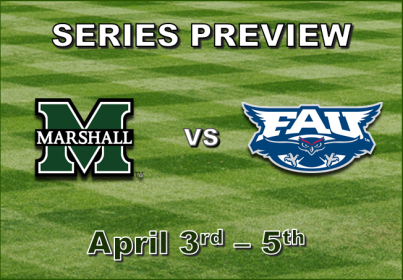 Sitting in 3rd place in the conference, the Owls will look to improve their 6-3 conference record over one of the less powerful C-USA teams in Marshall, who have just 2 wins in 9 games against conference opponents. FAU has showcased arguably their most powerful asset, offense, in 3 of their last 4 games, outscoring opponents 30-14 in that span. The Owls have at least two players in each in the top 10 of the 6 major offensive categories (AVG, SLG, OBP, R, H, and RBI), with a majority of the stats shared among starters such as Kerr, Sanger, Santiago, Puerta, Dicks, and Collins. With his poor start last week, Saturday's starter Drew Jackson spiked his ERA up to 1.91, which holds as the 3rd best in the conference. Jackson still does lead in opponents batting average, holding them to .181 in 7 starts. FAU recorded 13 strikeouts on Tuesday's game, bringing their season total to 237. This marks the ninth time that the Owls pitching staff has gotten more than 10 K's in a game, with their most coming in a 4-2 win over MT, where FAU struck out 18 batters. Sunday's starter Brandon Rhodes has sic starts on the year, but has yet to factor in a decision. Marshall comes to Boca Raton for the first time over the weekend coming off of a huge offensive performance against Miami (Ohio), winning by the final score of 16-3. The Thundering Herd, who have not won a 3-game series since taking 2 of 3 from FAMU opening weekend, have struggled in conference play, only taking one game from FIU and UAB, and getting swept by UTSA in their conference opener. Offensively, Marshall is lead by South Florida native Sergio Leon, who is boasting a .343 batting average and leading starters in RBI and doubles. Other batters to look out for are Corey Bird, who is tied with Leon for most hits with 35, and TJ Diffenderfer, who leads Marshall in slugging percentage and shares the lead in home runs with 3 big flies. The Herd have had their struggles on the mound, with only 6 pitchers holding an ERA under 4.00. From the bullpen, Kolin Stanley (2-2, 1.93 ERA) and Caleb Ross (2-2, 2.35 ERA) will look to shut down the potent Owls offense. Friday's starter Matt Margarironda (7.39, 0-4) has given up 29 runs in his 6 starts, which is a statistic that may bring confidence to this high run-scoring team. Weather for Friday looks to be clear, but thereon, Saturday offers the slight possibility of rain, and Sunday shows a 50 % chance. Game time temps will be in the upper 70's Friday to lower 80's both Saturday and Sunday. I'm going to be doing the unthinkable, and rooting for a Rice sweep this weekend. That would take MTSU to 8-4, and, hopefully behind FAU at 9-3. However, that would move Rice to 12-3; however, we still have our chance to take Rice down. This would put us in a position where we do not need help and can handle thing on our own. After this weekend, MTSU only has one more conference series that against a them that has a winning record in C-USA play. That series is at UTSA, which currently stands at 5-4 in C-USA. The other series are hosting Southern Miss (4-4), hosting WKU (4-5), at Charlotte (4-8), at Marshall (2-7), and hosting LA Tech (1-7). After this weekend, MTSU's C-USA opponents have a combined 20-35 record (.364). We host Rice, which should come in well-rested as they are off the previous weekend, and between April 26 until we play on May 8 only play a single game again Texas A&M-Corpus Christi on May 6. Excluding MTSU this weekend and FAU, Rice travels to UAB (5-4), hosts UTSA (5-4), hosts FIU (5-4), and travels to WKU (4-5). Those opponents have a combined record of 19-17 (.528). After this weekend, excluding Rice, FAU faces UAB (5-4) on the road, hosts FIU (5-4), travels to Southern Miss (4-4) and WKU (4-5), and hosts ODU (3-6). Those opponents have a combined record of 21-23 (.477). So, in short, if Rice sweeps MTSU, and FAU sweeps Marshall, all FAU needs to do is gain one game on Rice and then win that series (or stay even and sweep Rice), and stay even throughout with MTSU. Then, further assuming no other team makes a big run, no rain outs, etc., FAU will take the regular season title. As we hit the halfway point in conference play, this will be my first weekend of scoreboard watching with more than a passing interest. If I waske up Monday morning without FAU needing any help, I will be one very happy Owl. I'm going to be doing the unthinkable, and rooting for a Rice sweep this weekend. Game One of this weekend's series is set to begin at 6:30. Marshall: CF Bird, ss Sergio, LF Gee, 1b Diffenderfer, DH Dean, 2b King, 3b Dundon, C Reed, RF Fajardo. RHP Margaritonda set to start for the Herd. FAU: 2b Kerr, 1b Lashley, RF Sanger, 3b Santiago, CF Collins, DH Puerta, LF Dicks, ss Chatham, C R. Miller. RHP K. Miller gets the ball for the Owls. Top 1: Miller's pitch gets fouled off and we're underway on a clear evening in Boca Raton. Mid 1: Miller lets runners on the corners, but K's 2 out of 3 to end the early threat. Kerr to lead off for #FAU in a scoreless game. Btm 1: A mental error by the Herd defense sets up a 2-run triple by Collins to give the #Owls the lead early! 2-0 #FAU. Btm 1: Puerta drives in Collins on a hard hit ball to the left side! 3-0 #Owls. End 1: Dicks lines out to 2nd to end the inning, but not before the #Owls offense gives K. Miller an early lead. 3-0 #FAU after 1. Top 2: After a K and fly out, Reed cranks a homer over the LF wall to put Marshall on the board. #FAU now leads 3-1.